Amateur astronomer Jack Newton took this photograph of Comet Lulin. Feb. 6th: Comet Lulin glides by Zubenelgenubi, a double star at the fulcrum of Libra's scales. Zubenelgenubi is not only fun to say (zuBEN-el-JA-newbee), but also a handy guide. 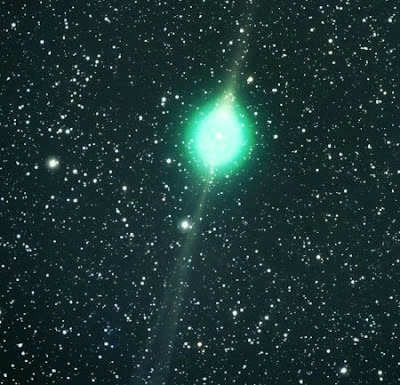 You can see Zubenelgenubi with your unaided eye (it is about as bright as stars in the Big Dipper); binoculars pointed at the binary star reveal Comet Lulin in beautiful proximity.